Best Western Colonial Village Motel est idéalement situé dans le centre de Warrnambool. Venez découvrir et profiter de notre hôtel à côté des principaux sites touristiques. Réservation au meilleur prix et offres exclusives toute l'année. 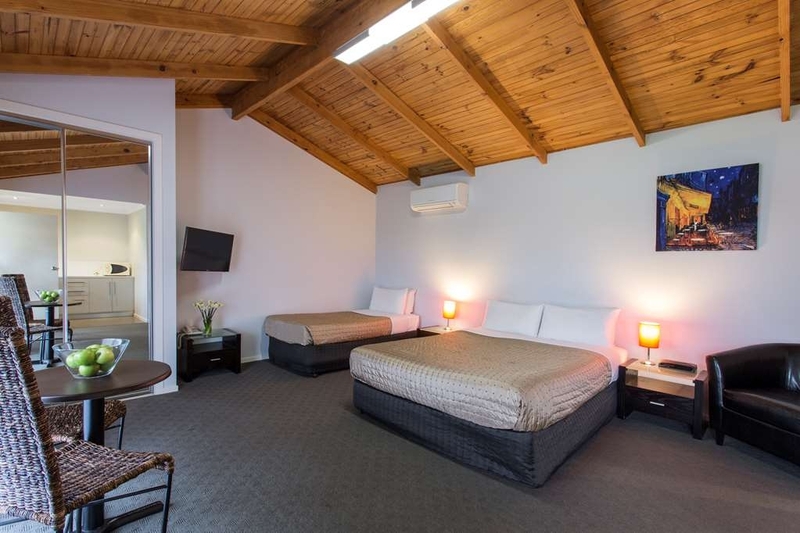 Le Best Western Colonial Village Motel offre à ses clients une retraite après une journée animée, avec des chambres de style cottage à Warrnambool et tout le confort pour vous assurer un séjour où vous vous sentirez comme chez vous. L'hôtel propose des unités pouvant accueillir un nombre variable de voyageurs. Chaque cottage est idéalement situé sur 1,2 hectare, dans un cadre calme et paisible avec vues sur le jardin. Cuisine équipée dans la plupart des chambres. Des chambres simples, doubles, avec lits jumeaux, et des suites familiales avec deux chambres sont disponibles. Toutes les chambres disposent du Wi-Fi et Foxtel gratuits, air conditionné et télévision LCD. Idéalement situé au nord de Warrnambool, à seulement quelques minutes du centre-ville, le Best Western Colonial Village Motel est à environ 1 kilomètre des principaux magasins, restaurants, hôtels, et nos églises historiques sont à cinq minutes en voiture des plages de baignade de Warrnambool belles et impeccables. Un centre commercial commercial local avec supermarché, agence de presse et pharmacie se trouve à 500 mètres de l'hôtel. À quelques minutes à pied du motel se trouve une piscine intérieure chauffée, un sauna et spa, un gymnase, une piscine olympique, des jardins botaniques et cinq courts de tennis intérieurs. Passez un excellent séjour ! We had a large room with a king size bed that was very comfortable. 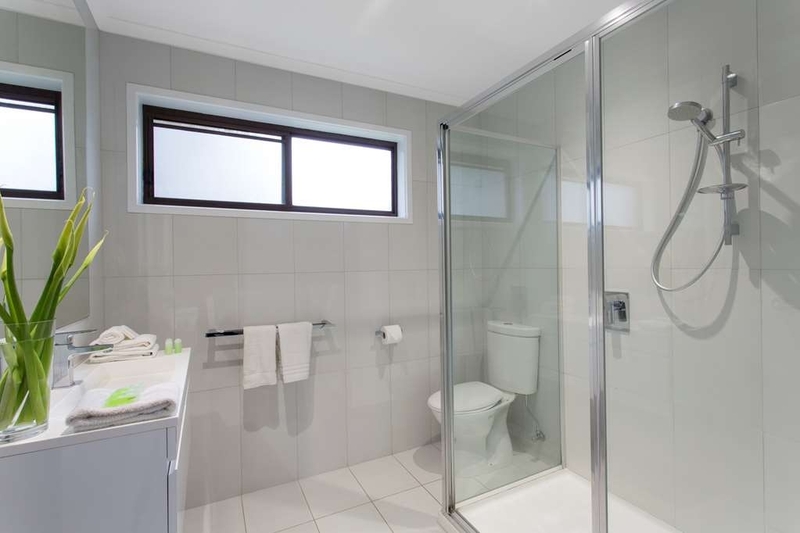 The en-suite was small but the shower was very good with a good flow of hot water. The room was properly serviced each day. The small kitchenette was sufficient for our needs. Wifi was good. Parking was tight but we were able to park in front of our room. Location is not convenient to central Warrnambool. The staff were friendly and helpful. The roof is metal and the rain was very noisy particularly as the unit had cathedral ceilings. A lovely, unfortunately short stay, was had at this Hotel. Although not right in town centre, there are shops, including supermarket within walking distance. Just a short drive will take you into town and waterfront. It was nice to find a spacious clean updated hotel room with kitchen facilities, at a very reasonable price. Would definitely stay again when next in Warrnambool. "More than enough !!! " Stayed for a night at end of our drive on great ocean road. We got a bit late but it was heartening to see the lady wait up for us and help us with the ACs as we fumbled to get them going. 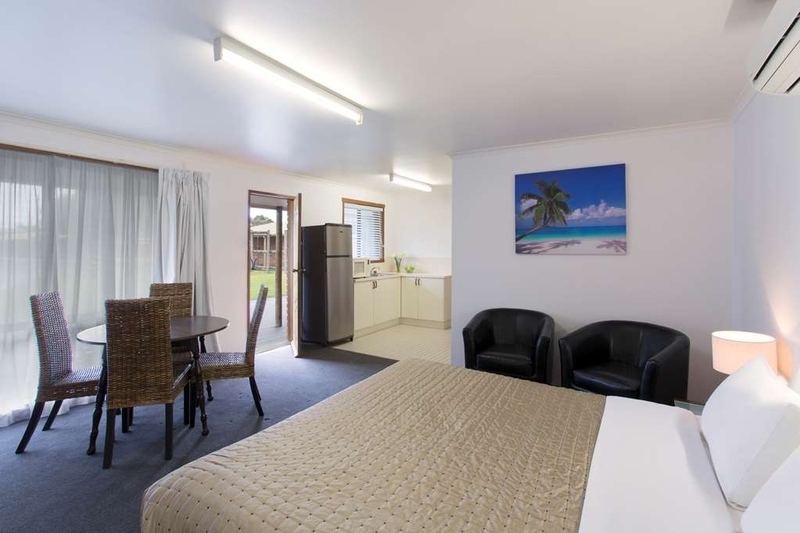 Gives you a bit more than a motel - well spread out, spacious accommodation, functionally furnished and friendly staff. Not many motels can boast of all this !!! "Best to miss this place"
Really disappointed with the facilities at this place. So many things were wrong in my room - ripped carpet, broken telephone line, broken toilet seat, really uncomfortable mattress, noisy exhaust and the list goes on. To make things worse, even the staff were utterly useless. They didn't clean the room unless I asked them (at least twice), they didn't empty the rubbish bin, they didn't replace the towels and the list goes on again. I literally had to ask them twice for everything. Next time, I would cancel my trip rather than to book with them. 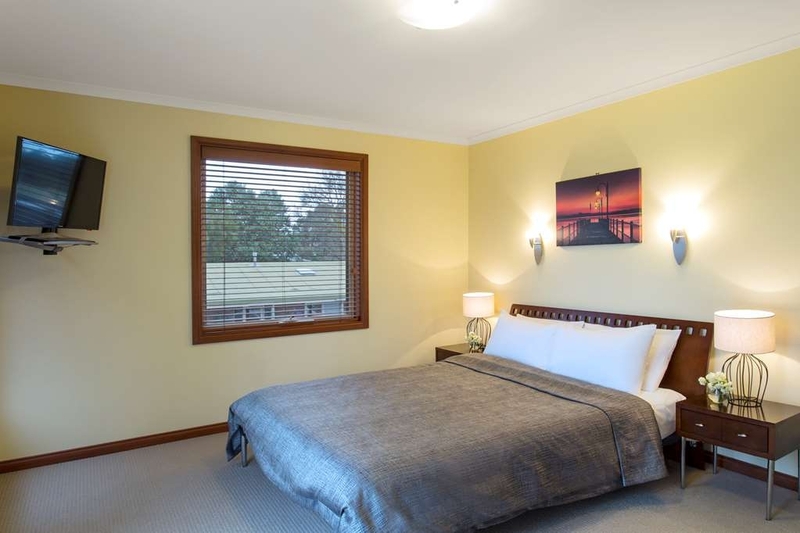 "Great Service & Great Town House"
We arrived in Warranambool lateish one night looking for accommodation. Went to reception to find the Best Western Colonial Village booked out, but was offered accommodation at the King Street Appartments. Staff couldn't be more friendly & helpful. The appartment was great, spacious & clean, actually 4 very spacious bedrooms, spa, back courtyard, garage, huge TV just to mention a couple of the features. Will definitely look this up again when back in Warranambool. 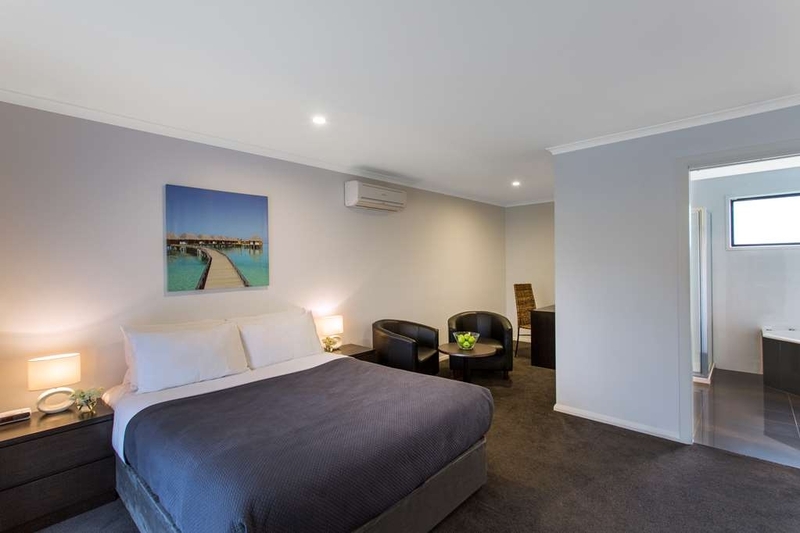 I stay here on a regular basis for business, the staff are great and know me by my first name, the check in is very easy and the rooms always spotlessly clean, the location is off the main highway and is very quiet,it's a short drive/walk for dinner at any of Warrnambool's restaurants. Great place for a good nights stay. Friendly staff, clean rooms, secure,cable tv, good showers, handy kitchenette and close to shops and the centre of town. A handy place to stay after The Twelve Apostles. Thanks. Excellent property, the ladies at the front office are great and very helpful. I have stayed here a few times now and I am happy. They have another property which is closer to town and a little more upmarket, townhouses. Good stay. Big spacious rooms with a comfy bed. The cooked breakfast was very nice and arrived on time.Check in and out was easy and the motel is close to a shopping centre and not far from the centre of town.. Relative to the extraordinary low tariff, this was a 10 out of 10 overnight stay. 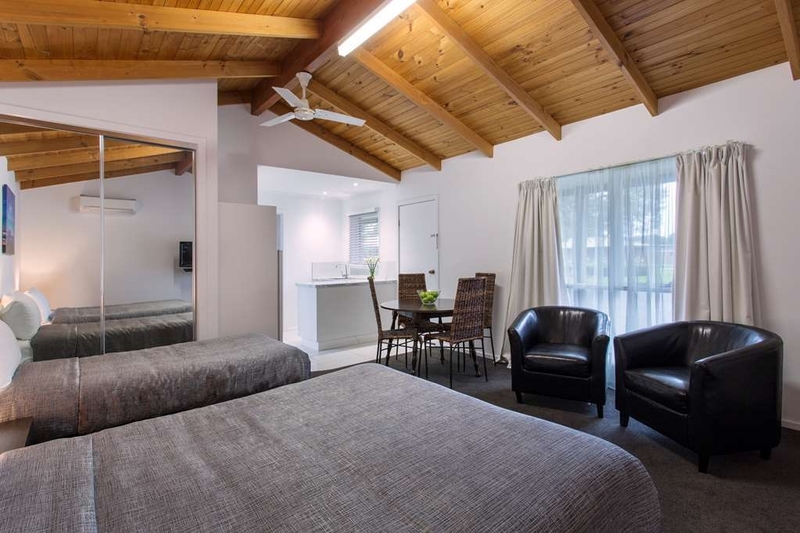 Extremely comfortabl bed , hot hot shower, spacious room, clean, wifi and foxtel, so quiet you could hear yourself think, kitchen, and a carport. It is 1960's decor and cupboards need repair, but it is due for refurbishment soon, so I am told. Absolute bargain. 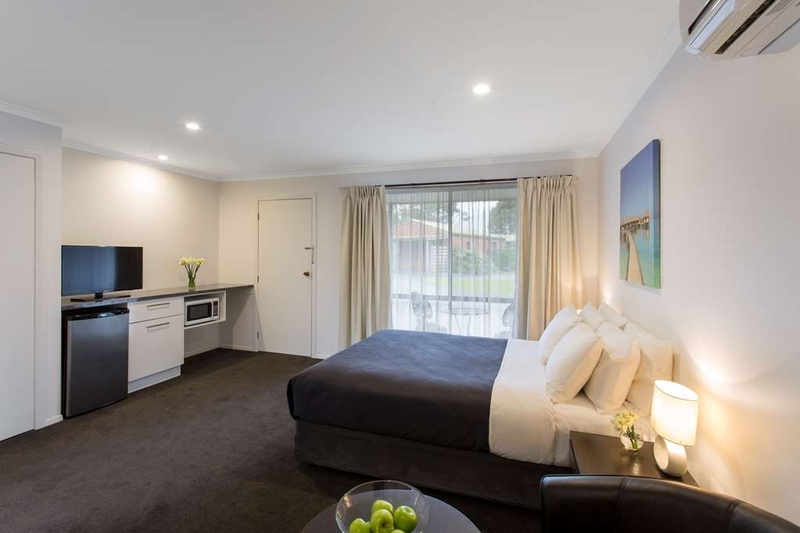 "Still ticks all the boxes"
This motel is still one of the best in Victoria for value for money. The units are large and well equipped with many having kitchens and dining area, facilities include children's playing area and tennis court. The staff are very friendly and efficient making you feel welcome. We booked last minute having decided to stop overnight in Warrnambool. The hotel is in a convenient location and easy to find. Loved that it was older person friendly with no stairs. The room was spacious and well laid out. The spa bath was a welcome surprise. Overall a great stay. "Good location, great value for money, excellent customer service"
We stayed there during 2018 Easter and since we arrived to the reception the customer service was great. Sue, the manager, was amazing and swap our reservation for one of the townhouses, which pretty much is a full house. We were a group of four and the place was very nice, with 2 bedrooms and 3 bathrooms. I totally recommend the place, specially the townhouse for a similar group size. The area was quiet, perfect for a relaxing escape of the noisy city, but is close to Woolies and other restaurants (a few minutes driving). I would definitively stay there again! "Great value, big rooms with kitchenette "
We stayed at this hotel on the way of our Great Ocean Road trip. The rooms were surprisingly big, clean and the kitchenette was very helpful to prepare our late meal. The location is a close distance from restaurants and stores. Highly recommended. Lovely & clean spacious room, very quiet at night, would definitely stay again. The lady at reception was friendly & helpful. Price was good for a Saturday night. Bed very comfortable and the bathroom was spotless and big. Had a family function on in February. We all decided to stay at this motel and catch up for a few day's. Each family booked in about 6 weeks beforehand. I rang and the person on the end of the phone said other family members had booked in and she would also book me in for a room for 2 nights.When I arrived I was told I was not booked. Told her when I rang she looked in the diary. She had my details but not transferred the information into the computer. The motel was booked out so had to find another motel Not that they cared.Very poorly run I would say. We had a very pleasant stay, A warm welcome, extra large Queen room apartment. The room was at the back, very quiet and nice to sit outside. We had a special deal so excellent value. We would stay again. "Great hotel and very good price value!" We stayed only one night in this hotel but really liked it. They make special offers and we got a room for only 81 dollars. The owner is highly professional and nice. The roon was awesome and very clean. I would reccomend this place!!! "Cosy place and great location"
I was really surprised by the high ranking on TripAdvisor, as I've used it for over a decade and it's always accurate. We booked last-minute based on strong reviews and were disappointed. When we arrived, the receptionist, who was not friendly, quoted us a price much higher than online. When we said we'd rather book online, she grudgingly came close to matching the online price. When we returned to our room after dinner, we discovered the heat did not work. A new (nicer) receptionist had to make two visits and fiddle with the machine for nearly half an hour before it started working. The heat never did reach to the bathroom, making for some very cold moments before and after showering. The room was dated and worn (the carpet has started to unravel in places) and a bit dirty (cobwebs on walls, stains on the carpet and sheets). The room, at least, was very large, with three beds, high ceilings and a desk, dining and sitting areas. However, you could do better. I would not recommend this hotel, nor would I stay in it again. The hotel is fine. There is nothing wrong with it but it's all just very odd. First, the receptionist tried to charge us $10 more than their online price. Once we had a room, the heat didn't work and the receptionist couldn't get it to work for 20 minutes. It was impossible to turn a light on besides the main lights. There were tons of lights but most of them were not plugged it and there were not enough plugs to plug them in. There were bedtime lights but they too did not turn on with any variation of light switches and switches on the lights. This hotel is decently ranked in the city. Nothing in particular was a big deal and we were happy with the price, but it just was all very odd. My wife and I visited Warrnambool to view the whale nursery at Logans Beach. We made an internet booking at Colonial Village Motel, not already knowing it. We were delighted as the venue far exceeded the norm. "What an amazing comfortable stay!" I can't stress enough what a comfortable and beautiful stay we had after a long drive down the Great Ocean Road. The 2 level apartment/townhouse was so spacious and made us feel at home and the space was so nice to unwind after the day. Beds were comfy and we were almost sad to leave such a great place. If we stayed an extra night it would have been here and for future stays we will come here again. Looked up some last minute accommodation on my smart phone and this was very well priced $90. Beautiful warm spacious unit. 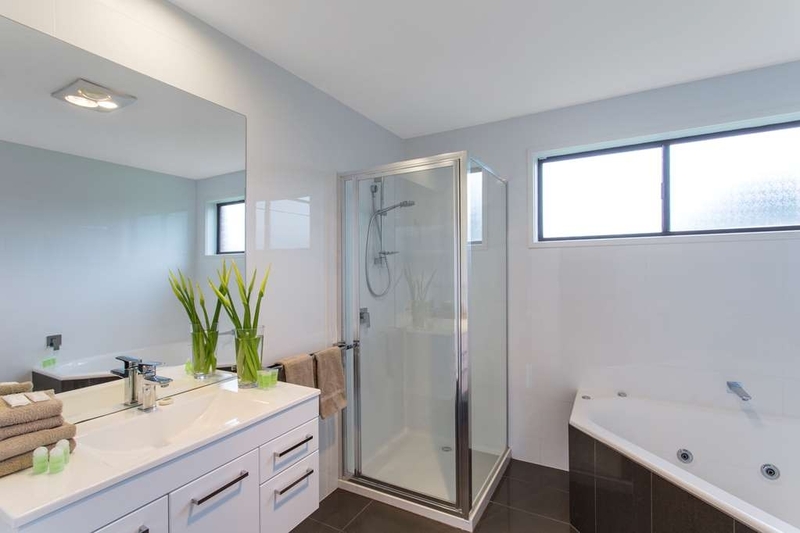 Huge bathroom with a spa bath and separate shower. The bed was very comfortable and had electric blanket ( the night got down to 0 degrees) Microwave and fridge came in handy too. We would stay there again . What a lovely little place. Beautiful rooms, very clean, comfortable big beds and more than enough amenities. Motel is pet friendly - stoked that we were given such top class accomodation. Thank you, we will all certainly be back. 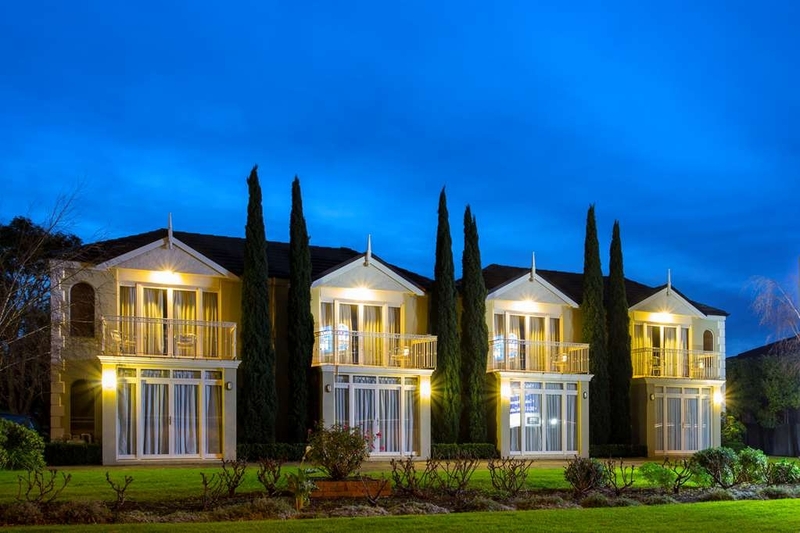 Eleven months since my last visit and it is as good as ever one of my favourite motels in Victoria, it is quiet, clean and spacious each unit is self contained and suitable for self catering. It is a little out of town but there is shopping centre nearby that has everything. "Large rooms, clean and tidy perfect for familys"
I stayed here back in February for three nights - one night through Wotif and the rest directly with the hotel. I was suffering a horrible cold at the time and was only staying here so as not to spread my infection to another very ill family member. 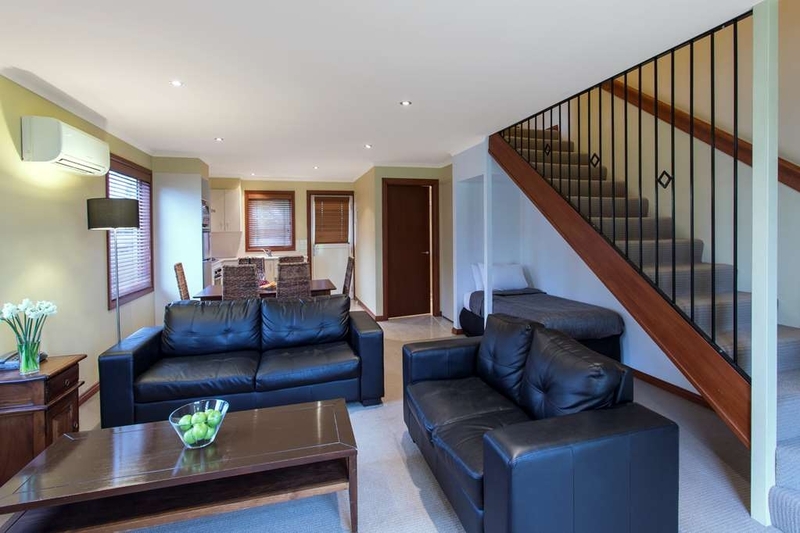 There was only myself staying there but I was in a two bedroom, two level apartment and was really impressed with its overall size and the facilities it provided - it would be great for a family with so much space. There was a spa bath upstairs in the bathroom which was great (so rarely used these days but it turned out to be a bit of a godsend). The Motel is away from the main part of town - about a five or six minute drive but there is a supermarket and small shopping centre close by and it is very quiet. "More than just a Motel"
Stayed only for one night but would have liked to stay longer. Very large room with a kitchen as well, Reasonable priced and excellent value. Loved the spacious layout of the entire village - rooms were like a cabin with a little veranda- 2 units were side by side so we only had one unit right next to us. Was nice and quiet. Plenty of parking. Tennis court, BBQ. Very hospitable and helpful hosts. Will definitely return. "upgraded and well looked after"
When we arrived at Best Western colonial Village Motel, we met with the proprietor who was a genuinely lovely lady. She proceeded to upgrade us to the King Street apartments which suited our family of five perfectly. These apartments were central for groceries and allowed us easy access to the town. As we chose to phone the Motel directly to book our five night stay, rather than use a booking service, we saved money on our booking also. It made our trip very nice and we would return to either establishment again based solely on the service and hospitality. "Great value for your dollar "
A lovely pleasant room with a great sized bathroom, 2 big lounge chairs big tv, plenty of extra power points, and very quiet as way off the road with even a carport. Only glitch - no hair dryer so pack a travel one if you need to dry the locks every day! Friendly reception- would stay there again. "Quality accommodation just lacking some basic items"
Great location, just off the main tourist area. Stayed in a 2 bedroom apartment, these are two story. Very comfy and clean but just needed to be topped off with some basic items to get a better rating. These are apartments, with full kitchen, yet almost nothing for cooking in is supplied, just a basic oven dish. Not 1 container to store any left over food in, something with a lid would have been great. In the second bedroom with two single beds, there were two windows, both window winders were broken, 1 window facing the road and the check in reception was stuck open, letting in road noise, cockatoo screaching at night and at 5.50am every day you were woken by the staff pulling up and parking under the window. It was a long weekend, so prices were at a premium $350 a night, so nice and comfy but for that price expected a little more. Their online page mentions a tennis court, bbq area and a gym. When asked about the gym receptionist pointed down the road with vague answer. Did eventually find an aquatic center in the area, there is a concrete walking track near by that we made good use of. "Great location in small town"
Quiet location, comfortable beds. Easy parking and easy to find. All the things you need when your coming in late and just need a place to stay. Close to market and bottle shop. Several dining options down the road by car. We stayed in Cabin No.2 for three nights for work in the area. l found it to be a good clean place to stay, at a reasonable rate for that busy time of the year. All went well with the cleaning of the room and change of towels, shower was good and hot, normal big T.V and comfortable beds. we stayed on night in cabin 6 and it was so lovely, the second bedroom had three single beds which i thought fantastic. massive king bed in main room & everything was nice and clean. plenty of room to move around, parking right out front too. check in and check out was a breeze, staff are so friendly nothing is too much. PLENTY of soap, towels and amenities in the room. we will make this our regular place now. thankyou so much. 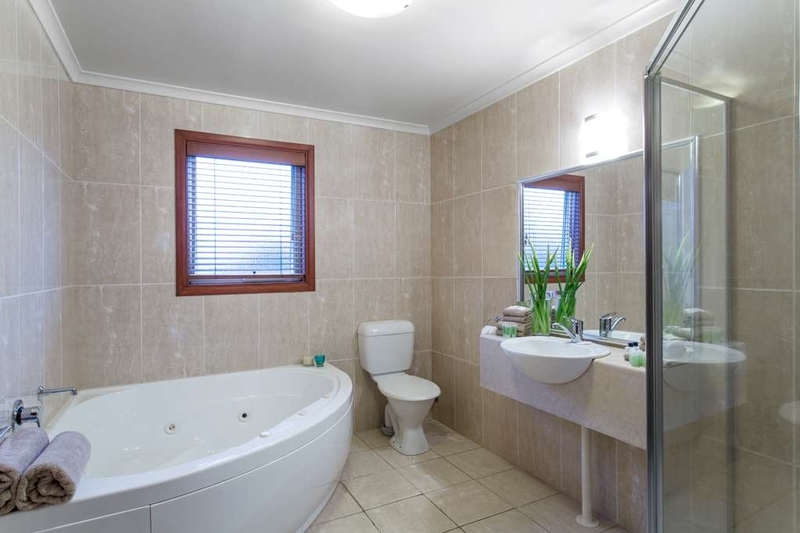 "Great location and spacious room for a visit to Warrnambool"
The room was very spacious with a kitchenette, clean bathroom, TV and plenty of space to put all of your belongings. Highly recommend for a family or couple and the grounds are also well maintained. Only issue was accessing wifi was a little difficult however they assisted us in the office, mentioning there is an upgrade in progress. Loved this motel. Large room and kitchenette which was great to wash all our bowls and dishes we had used while travelling. Love the cabins with just 2 attached so there is always outside space and undercover parking. Having 2 beds was also a bonus. Only downside was the mould in the bathroom and rusty shower screen. "Cosy home away from home." 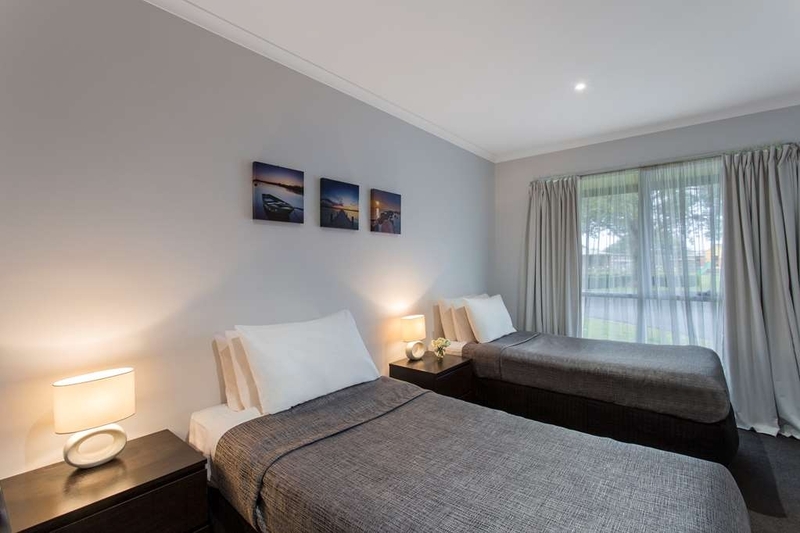 Our family have been staying at the 'Colonial' for a few years now when we visit Warrnambool & we find it a very clean, well priced, quiet accommodation close to the centre of town. When we stay at any accommodation, we wash (with hot soapy water) all our dishes, cutlery, saucepans etc that we intend using as some people just rinse their dishes under the tap. Then we're happy! I agree with Annette O, that self cleaning the dishes is a mistake as not everyone is fussy. Pillows and mattresses plus the sheets were 5 star. It's a quiet, well looked after place with lovely gardens including a tennis court. And the staff are lovely too. We'll be back. "Quite Motel off the Main Road"
This hotel was recommended by the Manager of a Hamilton Motel where we stayed earlier in the week. The Motel met all our expectations, Price was what we expected and was good value for money. It was very quite and our room was quite modern. We stayed here initially with a 2 bedroom booking, but on arrival we were upgraded to an apartment. 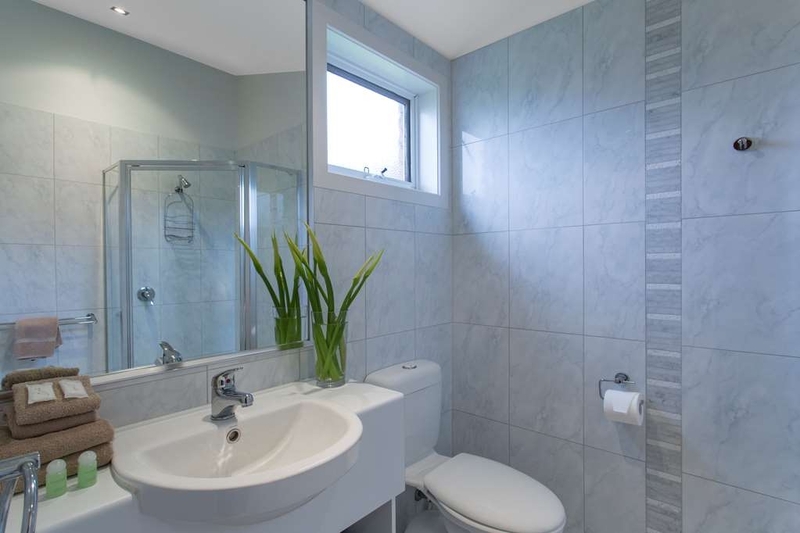 Fully self-contained with two bathrooms - one with a spa bath. Was quiet, clean and comfortable. Shopping centre is only a short walking distance away.. Only negative I have, and should be looked in to as I see someone else has recently complained, is finding tea/coffee/lipstick stains on the cups.. Perhaps the self-cleaning of the dishes in the apartments is to blame, but the cups should be replaced with fresh, clean ones regardless by the cleaning staff. A minor thing, but an important one. Staff were friendly and very accommodating. "For a family you can't beat quality and price "
We stayed at this motel for 3 nights whilst travelling the great Ocean Road. It is about a 5 minute drive to restaurant's shops etc from here. Would be a good walk. We paid $130.00 per night including breakfast which was a great deal for the winter season. The unit we were given was a good size and had everything we required. The cleaners need to pay more attention to the small details, ie stained coffee cups and previous guests hair stuck to the bathroom floor, toilet and shower. Whilst we realize that they only have a limited time to clean each unit a quick look over once finished is all it takes. We did bring this to owners attention and she supplied us with more cups and said she would speak to the staff - great outcome. The only other downside was the gentleman next door who had his tv very loud and on very late (not the owners fault) we spoke to owner about it and she moved us to a much quieter unit on our last night which we appreciated. This is a beautiful cosy place to stay. It's close to the city Centre and there are small shops about 20mtrs away including a lovely looking bakery. The staff were lovely and the breakfast was delicious. The rooms were fresh and nice smelling. Will deffinatetly be back some time. ????? Very clean cabin well equipped and quiet checked out most of the rooms in preparation for a group visit all were of a very high standard. Cleaning staff were very friendly and did a thorough job. Front desk was very friendly and efficient I would highly recommend this establishment. Overnight business trip and needed a bed for the night. Rate was too good to pass up and the motel had everything you needed. On my own but ended up with a two bedroom apartment which was huge. Would be great for families with loads of room and all the amenities required for an overnight or extended stay. Bed was excellent and only complaint would be a power point near the table would be handy for business travellers. This was great value for money. Very modern and very large rooms. Spa bath and kitchenette. Room had a queen bed and a single. Free wi fi available. Would definitely stay again. Quiet location with convenience store nearby. "Fantastic apartment for the family"
We arrived about 12pm on a Saturday and were greeted by a lovely receptionist who advised our room was ready for us to check in. We were in apartment 4 which contained a king bed and single in the main room and a separate room with two single beds. There was a small kitchen in the room with good sized fridge and a lovely bathroom with a huge double shower. The room has been renovated and was quite modern. The beds were extremely comfortable and each bed had an electric blanket for cooler nights. The apartment was spotlessly clean and there was extra blankets and pillows in the main cupboard. The hotel grounds were beautifully kept and there was a small playground located centrally which the kids enjoyed. Whilst the location is a 5 minute drive from the main town of Warnambool, there is a Coles and a few other shops about 2 minutes away. Overall we had a very enjoyable and comfortable stay, was great value for money and I would highly recommend to others. The room and service was great, but a pool in the warmer seasons would be much more preferable. The rooms are quite a distance form the town centre which is advantageous for a quiet location but a disadvantage for those wanting to walk everywhere. The room we were given was lovely and clean, the receptionist lovely and we were very happy with our stay here. The position is close to Coles and very easy to access. Gardens and surrounds were immaculately looked after. We would definitely stay here again and would be pleased to recommend. "Clean rooms, comfortable bed, hideous location "
This was an expensive stay for what we got, which was meant to be an 'apartment' but in fact was an end of terrace, ageing unit in a residential area, not near the sea. We arrived on Chinese New Year which meant every room, everywhere was taken and we were desperate. We paid for this over the phone from the tourist information office and I have to say I was disappointed on arrival. It's fairly ugly on the outside with limited facilities on site and next to a trunk road, incidentally your view!! However, the main bedroom was comfortable and we heard no noise from the road or next door neighbours. The children were comfortable and we ended up having a meal supplied from the local shop, conveniently just down the road. All in all it was a welcome bed for the night but greatly overpriced for its age, facilities and location. "Great stop for The Great Ocean Road"
We stopped on our way back from Adelaide to Melbourne prior to the Great Ocean Road. 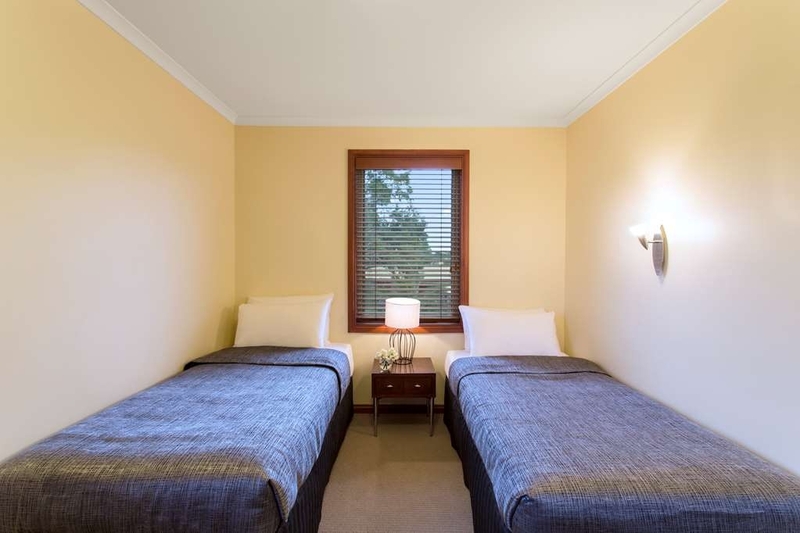 The hotel is situated to the north of Warrnambool and consists of chalet style rooms set in lovely garden surroundings. I am paranoid about traffic noise and Sue gave us a room at the back of the plot with covered parking and very quiet. There is a Coles down the road for essentials and so we were well set for the evening. A great place to break your road trip. Very large, clean and spacious room with comfortable king size bed. Kitchen well stocked with everything possibly needed. Very big bathroom. Close to shopping centre. Located on main road but very quiet. Host was very obliging. We were away for a week during the Christmas holidays and finding pet friendly accommodation can be really difficult at times. As everyone who travels with their pets usually book in advance and most places are booked. I was fortunate to be able to find a pet friendly hotel that allowed me to have my dogs with me. So, it made the trip more enjoyable. The hotel had all our needs that we required. A comfortable bed, clean linen, and overall very clean and tidy. The dogs had a great time with us and being located near a supermarket was good too as we didn't have to travel far for groceries, or take out food. The CBD wasn't far away and neither was driving to the beach. I would definitely stay again. "A pre Christmas family catch up"
A nice motel area with the rooms spread over several parts of the area. Our room was very nice inside allowing plenty of room to spread out. It was located just a short drive from the main street and just 500 metres away a shopping centre. My partner and i stayed here for a very reasonable rate and we were pleasantly surprised at how good and clean the room was. The receptionist was lovely and the room more than adequate. Bed very comfy and bathroom clean. We shall return. I stayed at the Colonial Village Motel and have recommended this motel to many of my friends. The rooms are very spacious. The staff is very welcoming and friendly. I will definitely stay there again. So glad we were out the back.Whilst we paid for a standard room and didn't have one of the 'flasher' units facing the highway, it was much more peaceful out the back. Rather than one long strip the motel units were grouped in twos and threes, on quite a large property. We sat on our verandah, had a drink and was surprised how quiet it was. As it wasn't overly busy I didn't know if it is a courtesy thing but the occupants were spaced out amoungst the buildings so we enjoyed a little distance from our neighbours. Rooms updated and modern. although it isn't in the middle of town, was quite near shops and supermarkets, which suited us just fine. Stayed in newly renovated "duplex" unit. Clean, tastefully modern decor could be described as almost luxurious. Weather was mixed so we appreciated the adjacent covered carport which would be a real bonus in the summer. Located a few minutes north of the business area it's a perfect compromise between accessibility and "peace and quiet". My husband and I stayed here over the Melbourne Cup weekend and it was above and beyond our expectations. Very clean, bed was very comfortable and location was great too - a short drive to the centre of town and quiet. Will definitely stay here again when we are next in the area. What a surprise this Motel was, we arrived to two wonderful ladies in reception who were so very friendly and happy to help with any request. After being directed to our unit, we were pleasantly surprised, a large unit, with two bedrooms, large bathroom, a huge master bed, and plenty of extra room. Just a short drive into the centre of town. Great place to stay. Stayed in a 2 bedroom family unit (used and charged as a 1 bedroom). Very comfy and well appointed. Older style but exceptionally neat and clean. Very friendly lady on Reception. 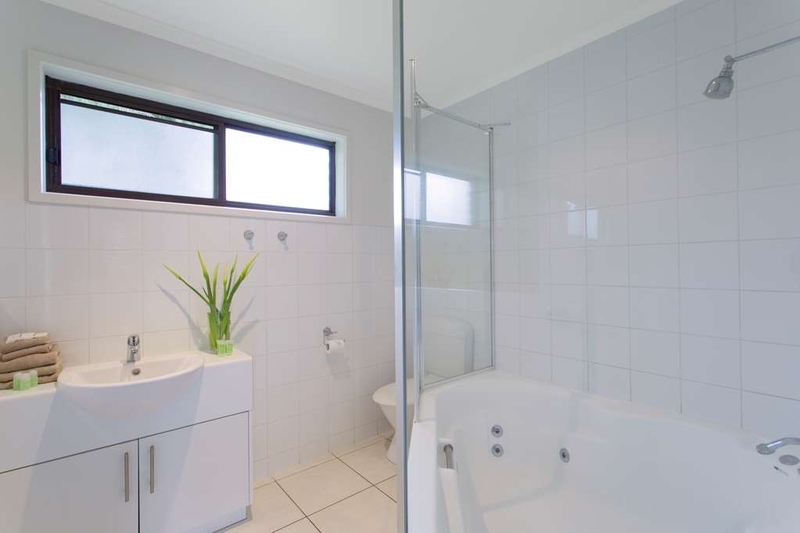 Great location, walk to local shops and a short drive to major shopping plaza and CBD. Highly recommend. This motel is a great place to stay a large spacious room with two arm chairs and king bed, nice hot shower well appointed kitchen, room service breakfast was very generous, complementary vouchers for a restaurant and other attractions in Warrnambool, very quiet at night good for sleeping, and our host who was filling in for Sue & Tony while away on holidays I think he did a great job. I will stay here again when in Warrnambool, a great motel at a moderate room price. "Lovely place to stay with space and relaxing atmosphere"
This complex was a great place to stay and I would recommend to others. I stayed at a cottage style unit at the back of the very large complex. There were several of these buildings with 1, 2 or 3 units per building, with adjacent undercover carport parking. They were very spacious, very clean and comfortable. There was a mini kitchen, microwave etc, good sized TV with some satellite channels , Air Con and all the regular amenities. FREE Wifi, very friendly staff, breakfast room service and local restaurant charge back facilities. Walking distance to local shopping centre with Coles etc, - the CBD would be a driving trip of approx 3-5 minutes away. Large open grassed spaces within property for kids to play. tennis court, laundry room, drinks and snacks available from reception, low but sufficient water pressure in shower (may have been my time of shower), front verandah to each unit building, - and the space was great - not confined in like other motels to create a really relaxing atmosphere. This property has been my favourite in Warrnambool so far in numerous visits. "Colonial Village Motel does Warrnambool proud"
"Expected an average motel .. ended up with 5 star service and amentities.Fantastic"